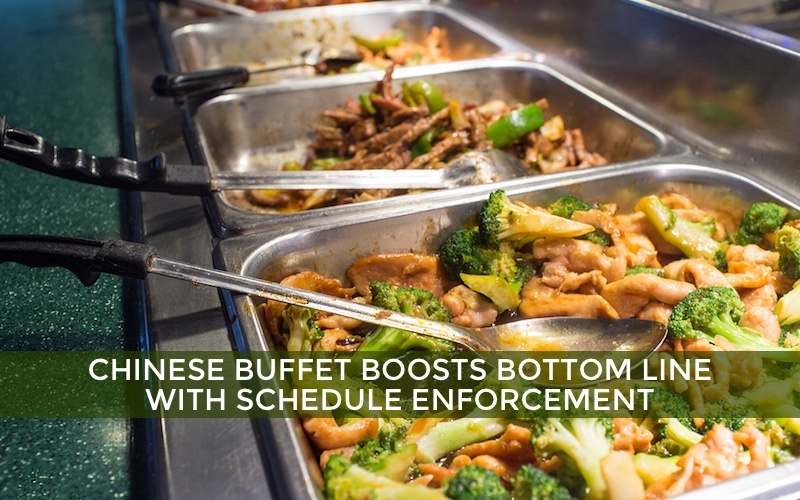 Today’s post is a case study of a Chinese buffet restaurant chain that increased profitability with TimeWorksTouch schedule enforcement. The eight location restaurant chain’s margins were diminishing due to rising food costs, so the owner was searching for ways to bolster the bottom line. The competition was tight in the working class community and an attempt to raise menu prices resulted in fewer diners. He decided to figure out how to limit labor costs. All of his employees were hourly except eight full-time head cooks and four managers, each of whom managed two restaurants. Several prep cooks and servers also split hours between locations. He knew he was paying a lot in overtime and wanted an employee timekeeping system for restaurants that could automatically track and prevent overtime shifts. During busy times, the managers were juggling so many balls that checking which employees had moved into overtime hours was impossible. Few employees wanted to work overtime anyway, so he knew that proactive overtime management would be welcomed by the labor force. Workforce Management Suite consists of TimeWorksPlus, TimeSimplicity, TimeWorks Mobile, and TimeWorksTouch. Each component integrates seamlessly for comprehensive restaurant Workforce Management. Each manager was able to enter all their employee and shift information in less time that it had previously taken to build just one monthly schedule in Excel. The schedule enforcement function prevents out-of-schedule punches and sends notifications before a worker hits the customized threshold. When a warning goes off on a supervisor’s phone, the manager is able to send the worker home before overtime kicks in. Accurate break tracking has also delivered a savings in labor costs. The mobile functionality has quickly proven to be an invaluable feature for managers and employees that split hours between locations. No more retroactively guessing punch times after the fact. Workforce Management Suite furnished an affordable solution that quickly paid for itself in just a few pay periods and continues to control labor costs with every single shift. Express Data Systems offers WorkforceHUB, the unified Human Resources portal that makes it easy to optimize the performance of your supervisors, employees, and company.